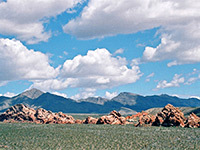 The small city of Mesquite is built beside the Virgin River right on the east edge of Nevada, adjoining the Arizona stateline. Most lies on the south side of I-15, including the usual collection of hotels, casinos and shops; the area north of the interstate is generally less developed, but home to several upscale housing estates, centered on the Wolf Creek, Redd Hills and Oasis golf clubs. A small amount of land beside the river is irrigated but otherwise the surroundings are barren desert, sloping gently to several mountain ranges, largest the Virgin and Beaver Dam ranges to the southeast, marking the edge of the Colorado Plateau. Hwy 170 south of Mesquite follows the Virgin River for a few miles then heads towards the mountains, to many scenic places including Whitney Pockets, Little Finland and Lake Mead NRA. Holiday Inn Express Mesquite benefits from a prominent, elevated position, on top of a small hill at the west edge of town, overlooking the center, and many rooms have fine views south and west, across the Virgin River valley to the rugged mountains that mark the edge of the Colorado Plateau. The four floor, 130 room, pet friendly property is partly surrounded by as yet undeveloped land, though guests are within walking distance of various locations including CasaBlanca resort/casino, Falcon Ridge Golf Course, Walmart Supercenter and Mesa View Regional Hospital. Accommodations (all containing a microwave/refrigerator) comprise standard rooms and suites, the latter with a sofa bed and private balcony. Free hot buffet breakfast is provided. The Best Western hotel in Mesquite is situated on the east edge of town, close to the start of the desert and less than one mile from the border with Arizona. The hotel is easy to reach, being just half a block south of exit 122 of I-15, and is less than two miles from all the casinos, golf courses and other leisure attractions in the fast-growing town of Mesquite. The pet friendly Best Western has an outdoor pool & spa, almost compulsory for hotels in south Nevada, and offers free deluxe continental breakfast. All guest rooms contain a microwave and mini refrigerator.